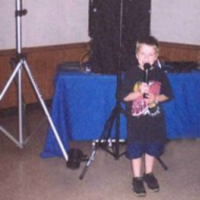 Your son or daughter will have a blasting singing like a rock star at a karaoke birthday party in NY. 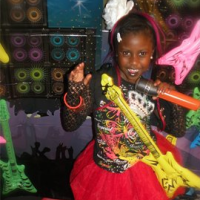 Every kid wants to be a famous rock star, so make that dream a reality for your kid's birthday! 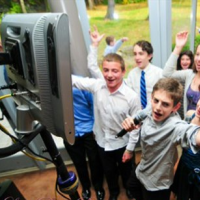 The children can show off their awesome singing talents with one of these karaoke party entertainers in NY. They will Take Care of Everything in NY! A top-notch karaoke party entertainer in NY, Iggy's Karaoke Lounge & Grill now hosts kid and teen parties at their chic NYC location! Choose between numerous party themes, including Hanna Montana, High School Musical, Rock Star, Pirates of the Caribbean, Princess, Dance, and more. They will take care of all the event details, including food, drinks, entertainment, dancing, photos, and of course, karaoke! 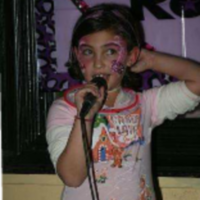 Book your kid's karaoke party in NY at Iggy's Karaoke Lounge & Grill, and then sit back and enjoy the party. Hire this Karaoke Entertainment Duo in NY! 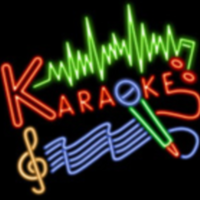 Bring out the singer in your son or daughter by hosting a karaoke party in Bronx with Sing 4 Karaoke. This party entertainment duo will come to any type of party within the New Jersey or New York area, and will make a custom NY karaoke party so you can get just what you're looking for! With endless amounts of songs and entertainment, Sing 4 Karaoke will make your kid's next karaoke party in NY unforgettable. They will provide theme parties, sing-a-longs, party favors, fun games, light shows, music, dancing and more! Hip Karaoke Entertainers that Come to You in NY! An interactive and fun karaoke entertainment service in NY, Expressway Music DJ's will make your kid's party cool and unforgettable. Great with both little kids and teens, the Expressway Music team with keep the party going for the whole two or three hours. Whether the party-goers are shy or outgoing, these NY karaoke entertainers will make sure everyone has a blast! Offering a variety of up-to-date children's beats including High School Musical, Taylor Swift, Glee and more, the kids will never want to stop singing with Expressway Music! Karaoke, Dancing & Games in NY! Invite Legendary Entertainment to your kid's karaoke party in NY, and throw your kid a memorable and fun birthday party! Whether your son or daughter is turning four or sixteen, Legendary Entertainment will make sure that the party is hopping from start to finish. Choose between numerous NY karaoke party themes such as Jonas Brothers, High School Musical, Taylor Swift, Glee, and more. Along with the awesome karaoke entertainment, Legendary Entertainment will also keep the parting going with interactive dances, games, temporary tattoos, face painting, and more. Make a Rock Star Karaoke Video in NY! Throw your little rock star karaoke party in NY with My Glamour Party. Choose the Rock Star Diva party package, and get a bunch of cool party favors and entertainment. This all-inclusive package includes a funky hair style for each girl, rock star clothes, a manicure, make-up, and of course, karaoke! The girls will even get a chance to make a music video while they are singing and dancing to karaoke, and they will take a group photo for the memory books. Everything's Included in this Party in NY! Come to the Birthday Zone for your kid's next karaoke party in NY! You can choose between one of their themes, including Hannah Montana, High School Musical or disco, or you can make your own theme! The party packages include a two-hour party room, pizza for the kids, beverages, games, dancing, balloons, and more! Let the Birthday Zone host your kid's NY karaoke party, and you will not be disappointed. The children will have a blast singing their favorite songs; they won't want to put the mic down! Have a Disco Karaoke Party in NY! 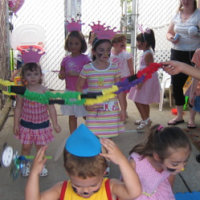 With an option of numerous karaoke party entertainment and services in NY, you can make your kid's birthday party just how you want it at Funbelievable Parties. 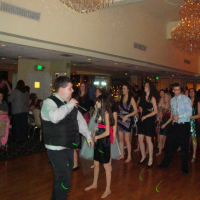 Choose the disco / karaoke party package, and your son or daughter's party will include lots of karaoke music, a necklace for each guest, inflatable instruments, music, games, and more. 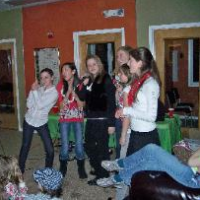 You can also add on the option of karaoke to any of the other fun party themes such as the diva or princess party. Also, spice up the party with some of Funbelievable Parties' party favors. Rent a Karaoke System in NY! Serving the Western New York area, DJ Johnny K is a premier karaoke party entertainer in Upstate. Offering an extensive collection of great songs, these karaoke machines are high quality professional systems. An experienced entertainer will be there to encourage everyone in the party to give it a try! If you are just interested in renting the system without DJ Johnny K entertaining the karaoke party in NY, then that is fine too! He will work with you for your kid's birthday party.